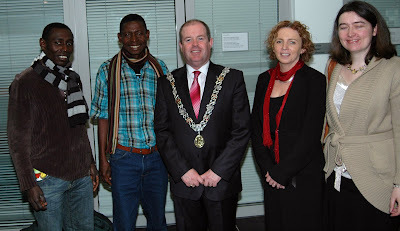 Fairtrade activists, local retailers, Oxfam, Trocaire and the Mayor of Cork welcomed Divine Chocolate and Kuapa Kokoo to the Cork School of Music. 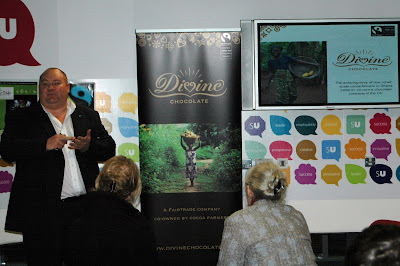 Divine gave presentations to the audience followed by Peter Gaynor, Director of Fairtrade Ireland. They then enjoyed a variety of Irish music played by the school. From Wales to Ireland and the final leg of the Divines ‘Chocolate makes the world go round’ tour. Paul and Kojo arrived in Belfast to the sound of drums as the Oxfam Ireland shop on Rosemary Street arranged a Fairtrade party in honour of the farmers and Fairtrade Fortnight. There was even a giant Fairtrade banana, a must at all parties. Then on to Queen University, awared Fairtrade status, for an evening with their business student’s. Divine Chocolate with Paul and Kojo gave presentation’s, followed by a local Fairtrade cafe, showing how Fairtrade is making a difference to farmers in Ghana and a difference to local businesses in Ireland. 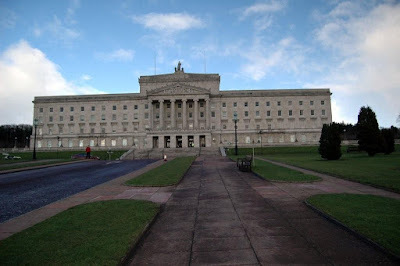 Today I attended the Belfast Fairtrade Award’s organised by the Belfast City Council at Stormont to recognise shop’s, restaurant’s and cafe’s who had actively promoted and sold Fairtrade product’s over the last year. We were delighted to see Oxfam, one of our Divine Chocolate’s top customer’s, win 3 awards and Co-op winning an award for best supermarket. You are currently browsing the archives for the Oxfam category.